Gary is one of the most accomplished tennis players produced in Southern Arizona. Growing up he was ranked number one in singles in Southern Arizona in every age category. He was number one in the Southwest section of the United States Tennis Association in the boys’ 12 and under and 18 and under categories. At one time he was ranked as high as 34th in the nation by the United States Tennis Association. He played the team’s number one singles position in all four of his years at Canyon Del Oro High School for whom he won Arizona State High School singles, doubles, and team championships. Gary qualified for and competed in national tournaments, reaching the singles quarterfinal in the prestigious Easter Bowl in 1984; the doubles quarterfinal at the boys’ 18 and under National Championships in Kalamazoo, Michigan and earning a singles victory over Pete Sampras. He received the Thomas J. Hoen Athletic Scholarship from Northwestern University. He would become a four year letterman there and co-captain on its 1990 team that won the Big Ten Conference Championship. Gary was a three time academic All Big Ten Conference selection and two time NCAA. Academic/Athletic All American. He was one of two college tennis players in the country to receive a scholarship from the men’s Intercollegiate Tennis Association. 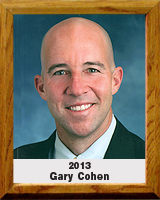 After college, Gary returned home, graduated from the University of Arizona College of Law and practiced law in Tucson. He has given back to the community by volunteering his time for many non-profit events. He is the proud parent of two boys, Grant and Austin.